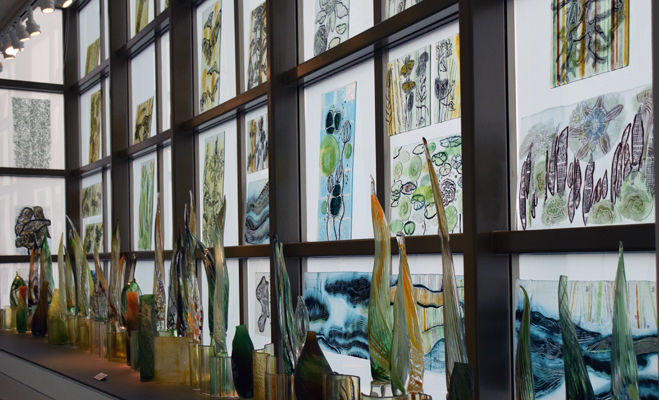 Rene Culler’s site-specific work is a mural in glass that celebrates the species-rich Delta and its atmospheric qualities. The Delta is a changing environment which is constantly shaped and molded by the weather and waterways. As the grasses, almost transparent, catch the light, Culler’s drawings and painting in glass suggest the landscape that southern Alabama holds so dear. The composition is a wall of natural light utilized as a glass canvas for drawing, painting and printing with vitreous enamels. Slumped dimensional panels and blown glass abstractly portray the location’s dimensionality. THE MOBILE DELTA: Glass & Light, organized by the Mobile Museum of Art, is underwritten by Drs. Joseph and Martha LoCicero and Geri Moulton in honor of Gordon Moulton, with additional support from the City of Mobile, the Alabama State Bicentennial Committee, the Alabama State Council on the Arts and the National Endowment for the Arts.